Do you have questions about our PV Labels labels packs, or questions about solar in general? Give us a call at 1-800-472-1142. 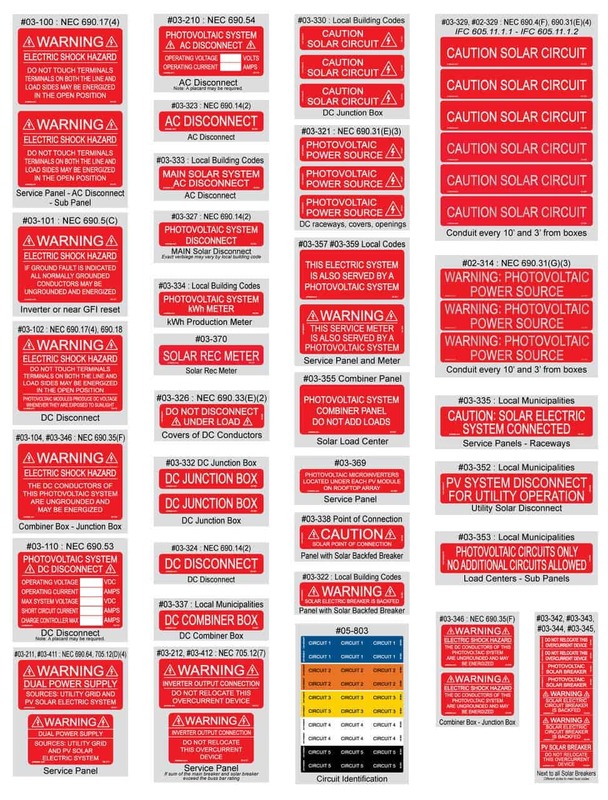 This assortment pack of PV labels is designed to meet 2011 NEC code requirements and includes 55 high quality labels. All labels are printed on premium 3.5mm white vinyl with permanent adhesive and UV sunlight-resistant laminate for years of outdoor use. PV Labels offers durable, high quality labels and placards for PV systems. Their labels are UV screen printed and UV inkjet printed, the highest quality you will find and designed to last years outdoors in the sun. Labels are available individually, or in assortment packs based on local NEC requirements. PV Labels also offers custom placards and labels. All placards and labels are made from high quality materials designed to last years in harsh outdoor environments. PV Labels uses only the highest quality materials including premium vinyl, engineering grade reflective, glass bead polyurethane, and SuperClear outdoor-rated polyester film lamination. They can withstand exposure to direct sunlight, rain, snow, ice, fog and salt air and are rated for a temperature range of -40°F to 176°F. All PVLabels products are designed to meet the requirements of NEC 690 and NEC 705 and there are multiple font sizes and options available to meet your local requirements.